What is an innovation? If you visit wikipedia page on innovation, you will see at least a dozen definitions. For most people that is far too many. I like working definitions which are (a) simple to understand (b) practical to use and (c) robust enough to fit multiple scenarios. In this article I would like to present two of such definitions of innovation and show how we can apply them to find out whether something is an innovation. I-squared-P (Definition-1): For a for-profit-organization, innovation is implementation of an idea resulting in profit i.e. idea + implementation + profit hence I-squared-P. This definition is a slight variation of the definition given by A G Lafley and Ram Charan in Game-Changer. 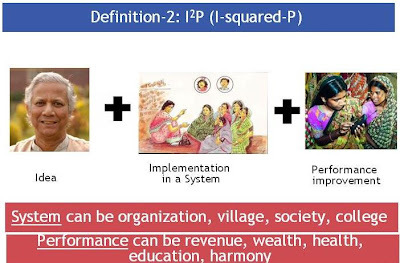 I-squared-P (Definition-2): For a system, innovation is implementation of an idea resulting in improved performance of the system (idea + implementation + performance improvement). System here could mean a company, not-for-profit organization, a business unit, a community, a city, a nation etc. Performance could mean revenue, profit, health, GDP, harmony, literacy etc. This definition is a slight variation of definition given by Peter Drucker. Patent filing: John, a researcher in ABC Shoe Company, files a patent for a shoe design which charges a mobile phone battery via energy generated from walking (hypothetical). This is an idea that is can be implemented. It is not clear whether it was implemented and whether it resulted in profit. Hence, we can’t say whether it is an innovation. Satyam scam: Accounts are manipulated for several years to show increased profits. This is an idea and it is implemented. It also resulted in increased profits in the books. So it fits the definition, at least superficially. Question is, should we consider “profits in books” or “real profits”? If we take profits to mean “real profits” then it is not an innovation. Air Deccan: Air Deccan introduced low cost airline service in India and created a new industry. This is certainly an idea that is implemented. Did it make profit? Cumulatively, until it was sold, it had negative returns (losses) on invested capital. So it is not an innovation as per definition-1. How about applying definition-2 with Indian society as the “system”? It has certainly benefited the society by creating a low cost airline industry. Hence, Air Deccan is a social innovation (definition-2). 26/11 Mumbai attack: Mumbai attack made things worse for India. But how about looking at it from terrorist organizations perspective? It must have improved the credibility of the organization that masterminded the attack several-fold among all terrorist organizations. Hence, it is an innovation as per definition-2 for the attacking organization. Agree with both the definitions and the examples - though the last one is a queasy - it indeed is appropriate from a certain viewpoint. I held a simplistic definition of innovation - an idea that is put in practice. But these two indeed put a correct additional spin on it. Thanks. Vinay, i will keep the focus on your definition to keep it simple, else there are too many things that needs to be considered. Firstly, the I-squared-P is difficult for me to digest. For me an idea is an outcome of creativity and implementation is a function of competency and skill. In that sense idea and implementation are 2 different things, except that they start with the same alphabet 'I'. Then there is P, which you have shown separately, for me P is part of the implementation. I find it hard to take out P from the implementation. So, if i now have to fit the whole thing like a formula (which i truly wouldn't do)it looks something like- I (idea) * (Implementation * (z)), where z ranges from 0 to 1 and denotes the quality of implementation, z=1 means the best quality. And the assumption that the idea is compelling to atleast a few people who are willing to put a price on it. Thanks for your inputs. The I-squared-P part is not intended to be a mathematical formula. I found it to be an easy way to remember the three components of the definition. It will certainly help us if you can share your definition of innovation.